You can’t erect a giant statue about the freedom and liberation without drawing some ire from people who aren’t free. That’s what the United States learned when it debuted the Statue of Liberty on what is now Liberty Island—and what it has learned time and again since. The statue was first unveiled on October 28, 1886, with a big debut party planned on what was then Bedloe’s Island. But there was one problem: the freedom the statue promised, as well as the party that celebrated it, was exclusive. The National Park Service refused entrance to women because, it argued, they would be there unaccompanied—whatever that might mean. But women in the burgeoning suffrage movement of the time saw right through that, arguing that the unveiling illustrated the problem with American society in general: a democracy that promised freedom to all but denied it to women (amongst other groups). Case in point: Women wouldn’t get the right to vote for another thirty years, and they would fight for things like pay equity, pregnancy leave, reproductive rights and basic Constitutional recognition for centuries after that—even up to the present day. Not ones for sitting around eating sour grapes, suffragists decided to RSVP anyway, crashing the male-centric gathering with a message of liberty all their own. Since they weren’t allowed on the island, they chartered a boat, holding banners and signs visible to the throng at the actual unveiling to call attention to the hypocrisy of the event. Lillie Devereaux Blake, head of the city’s only votes-for-women group, held a sign that got right to the point: American women have no liberty. “It is the sarcasm of the 19th century to represent liberty as a woman, while not one single woman throughout the length and breadth of the land is as yet in possession of political liberty,” argued Matilda Joslyn Gage, a writer, abolitionist and suffragist who had helped found the National Woman Suffrage Association. President Cleveland, who spoke at the event, did not acknowledge the protesters, and the ceremony continued without disruption. But the suffragists who took a stand that day helped add to the playbook of social justice movements before and since, using the symbols of American democracy to point out the lack of it. It’s a tradition that continues today, especially when it comes to Lady Liberty. Since its unveiling, the statue has served as the site of a myriad of protests, from the 1970’s women’s liberation activists who hung a Women Unite banner on the pedestal to drum up support for a national women’s strike; to the Vietnam vets who occupied Liberty Island for three days in 1970 to call for an end to the war; to the 30 Puerto Rican nationalists who occupied the statue for several hours in 1977, draping yet another banner over its pedestal—this time calling for Puerto Rico’s independence. 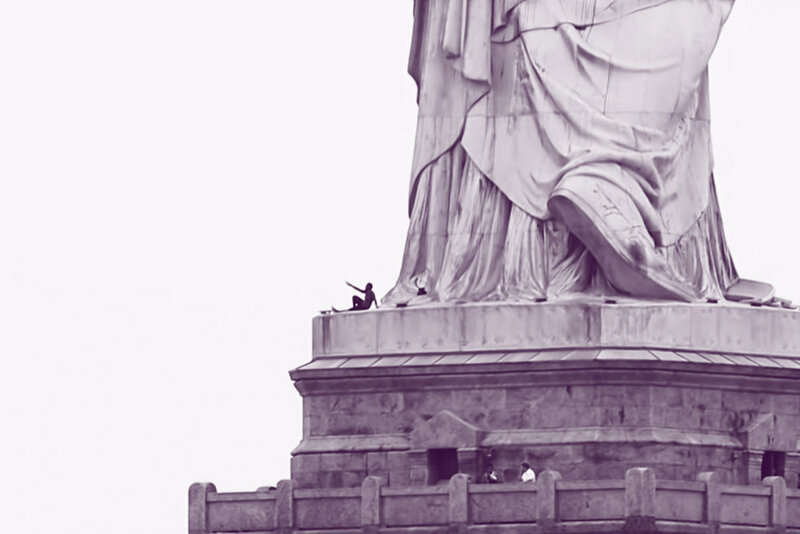 Most recently, activist Patricia Okoumou scaled the statue’s base to protest the detention of migrants at the U.S. border, scrambling around Lady Liberty’s sandaled feet for hours while calling for the reunification of migrant families. The Statue of Liberty might have been intended to highlight American freedom and democracy, but in practice it’s been used to highlight the distance between the country’s ideals and its realities. Until every American is truly free (and until American forces stop quashing the freedom of people worldwide) you can bet that the statue will continue to be the site of impassioned protest and dissent, as more second-class citizens use her sandals, robes and crown to call for a more just society.